Humptydump Dublin’s grandada of all rogues. To see Annie Liffey trip, tumble and caper. Seashell ebb music wayriver she flows. So, amused by this story and determined to share it with you, I took to the internet to see if there are any pictures of these early Work in Progress books. And I found something exponentially better. 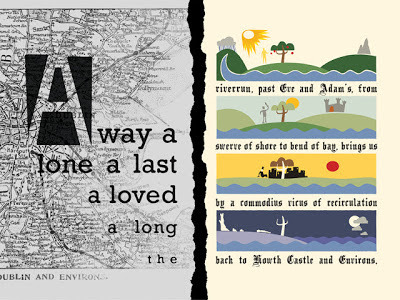 I don't know if you've already seen Stephen Crowe's project to illustrate Finnegans Wake, but if you haven't, check it out right now. It is amazing. His drawings make me want to drop everything and start reading Finnegans Wake (from which I only read fragments) just to be able to enjoy all of them as much as I do the ones I recognize. I posted one of his images here to give you a sample of this project's awesomeness. I'm not sure about the copyright implications, but if you click on the picture, it takes you directly to his site, where you should go and admire the whole series.